Are you searching for ways and intends to make your windows pristine yet again? Do you want to know how to skip chores like window cleaning without lifting a finger? You have chosen the right assistance – the experts of window cleaning in New Southgate will manage with this matter in short time. Your windows alongside their frames and ledges will look great, we guarantee that! You will no longer have to give up your free time – the results of our commitment will completely satisfy you. Our services blend first-class quality with reasonable price rates, so don't procrastinate – request an estimate now to save time, energy and money! We also provide our professional services in nearby areas: Osidge, East Barnet, Alexandra Park, Alexandra Palace, Noel Park. We use exceptional techniques of window cleaning to guarantee you will enjoy the superb end results. With our water fed pole cleaning system, jet washing and rope access equipment, you can be sure that your property's glass surfaces will be spotless. In addition, your property is in good hands – the cleaners are absolutely insured and carefully trained. Our water fed extension poles are attached to water supply reservoirs in the vehicles, while our rope access guarantees safety – even when we clean skyscraper-sized buildings. You can profit from these techniques immediately – dial 020 3746 3113! You can count on the abilities and competence of the professionals for cleaning all kinds of windows. The glass surfaces in our proficiency are: single or double windows, bay ones and sash windows. Of course, if you have French doors, garden windows, conservatory or skylights, we will make them sparkle, too. With our progressive techniques and next-generation machinery, we can deal with all kinds of window cleaning, even with hard-to-reach glass panes. With our skill and workmanship, the great look of your property will be accomplished immediately – the adepts of commercial window cleaning will achieve this. We utilise water-fed extension pole system for fast and effective window washing, up to the fourth floor. For office buildings taller than that, we use modern rope access methods. With our gear, we can reach the highest glass panes, even on the skyscraper-sized buildings London is so famous about. From small shops to towering business scrapers, we assure you top-notch services – take advantage, now! 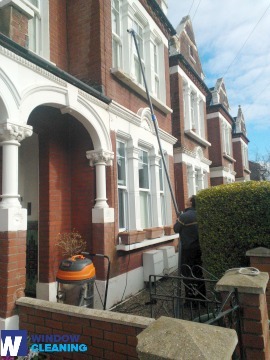 With our fast and efficient domestic window cleaning in New Southgate, you will enhance the look of your home instantly. We use purified water for inside and out cleaning of your windows. We make this possible by standing on the ground with the help of water-fed extension pole system, which is safe both for your home and the cleaners. Learn more – call us on 020 3746 3113 or complete our online booking form. You can also use our chat alternative. Our assistants are active 24/7 – you will get answers to your questions. You can be one of our happy customers today!